Heighten the flavors of your dishes with this all-purpose Kikkoman rice vinegar! This versatile vinegar is made from fermented rice and has a well-balanced acidity. It has a hint of sweetness from the rice and is milder in flavor than most other European and American-style vinegars. With no fat and no calories per serving, rice vinegar is a healthy way to enhance your flavorful meals and sauces. It's made with no artificial ingredients, and it can be used in place of wine vinegar or lemon juice. Though rice vinegar is popular in Japanese and Chinese cooking, it can be used in many cuisines. It is commonly found in dishes that are tangy or sweet, and it's also a popular salad dressing ingredient. Use it for pickling vegetables or add it to savory meat marinades. It also adds some zest to dipping sauces, soups, and stir-frys! Wow!!! Great price on this product! Unbelievable price difference compared to buying locally. I will be buying this from webstaurant again. I highly recommend purchasing this to save some money! Such an economical way to buy rice vinegar! I love having this on hand to make stir frys, fried noodles, and dipping sauce for spring rolls. Kikkoman rice vinegar is the best! I mainly use it for my sushi rice. Buying it at webstaurant is cheaper than getting it at a regular grocery store. Definitely a great product! 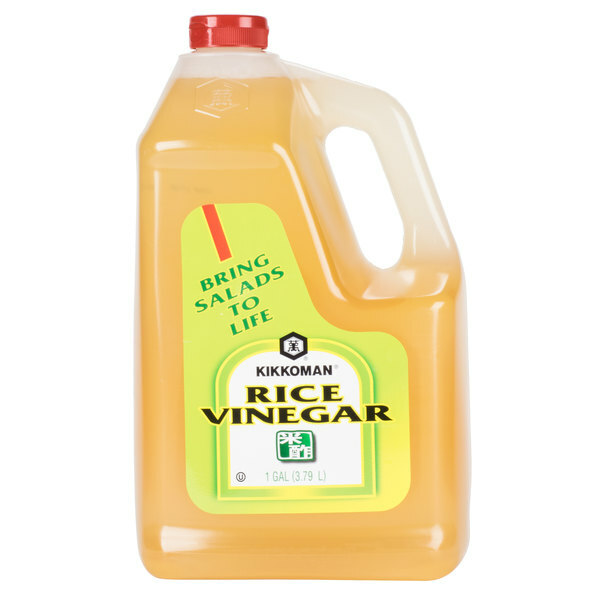 The Kikkoman rice vinegar is great and perfect for making Asian slaw and other dishes. The price is great and a really great buy for the big jug. secret ingredient, secret weapon! this is the good stuff right here, you go get you some. great price, great product, don't tell anyone like i just told you. Kikkoman rice vinegar is the absolute best in my opinion. I use it in my stirfrys and it really enhances the flavor. This size container is a great value! Every single product that I have ever purchased from Kikkoman has far exceeded my expectations. Nothing is different with their Rice Vinegar. This product works as a great base ingredient for a variety of ethnic slaws as well as pickled vegetables. Going forward I will likely always have this on hand. You can't go wrong with Kikkoman products. This was expected to be good and it was! The gallon size is a huge cost saver! I will be buting it again! This is a product that came to us with damage in the shipping. There was a heavy smell of the vinegar in the delivery truck and the driver suggested we dispose of the item due to other items in the truck that may harm the product. We agreed and emptied the contents. I have to say the fragrance was wonderful and I hated to have to dispose of it. Safety comes first. A nice quality rice vinegar from Kikkoman that is great for making our Asian slaw. The rice vinegar is a great quality and has a nice tangy flavor. Very good Rice Vinegar we used this for salad dressing and a number of Asian dishes we made. Our first attempt at ordering the bottle broke in transit and Webstaurant shipped us a new bottle right away, great customer service. and a great product too. A wonderful find with the gallon jug of rice vinegar. A great tool to use when cooking Asian cuisine. It has a great taste and flavor. My first ever batch is pickled onions is in the works. The 1 gallon of Kikkoman is living up to Kikkoman reputation of being a quality product. Can't wait to make sandwiches with them. 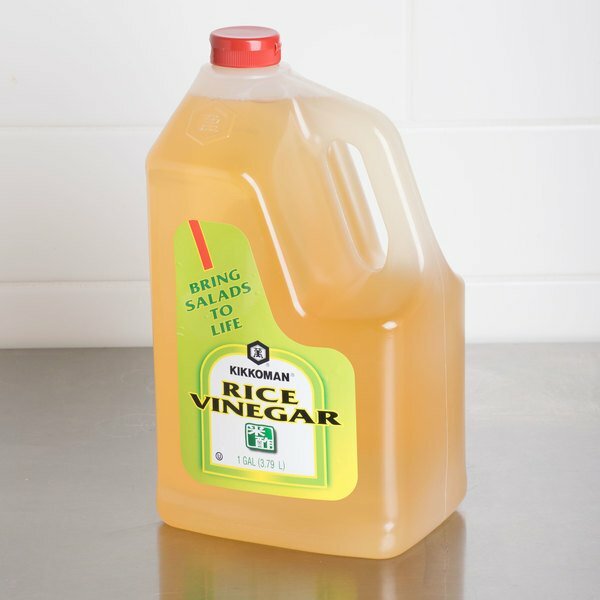 I cook Asian a lot and I am constantly using rice vinegar. I never knew I could get it in bulk. The price here is such a savings from buying many smaller bottles. Kikkoman is a trusted brand with a long history of quality ingredients and delicious products. This rice vinegar is great for any number of applications from marinades to dressings and even ceviche. It's really tasty and the large container is really handy so you never run out. A wonderful brand of rice vinegar that is great for cooking and mixing up house made dressings and marinade. The vinegar adds a nice depth of flavor. great flavor from a very trusted brand. Wish I had had this large size option in the grocery stores in the past 20 years. Only thing to watch out for is the very large hole under the flip top lid. Not a hindrance, just something to keep in mind. This one of the many wonderful Kikkoman products is especially good when used for making salad dressings. It adds to the flavor of many different types. I started making lots of stir fry but I could not get the flavor right. It was suggested that I try kikkoman brand rice vinegar. After struggling to find it in local stores I. Was happy to find it here. It gives the stiry fry sauce that perfect flavor. This Kikkoman rice vinegar comes in a case with four, one gallon containers. It a great neutral vinegar to use in any application. It is much milder than white vinegar. This is a great tasting vinegar, and not just for asian cooking. It's got less bite than white vinegar and no strong taste like balsamic or cider vinegar. It has a little sweetness to it. Of all vinegar varieties, I would reach for this one when making any vinaigrette. Try it in your cucumber or tomato salads too!